Welcome to Woodring's Floral Gardens!! Woodring's has a family tradition of serving the Central Pennsylvania Region for over 90 years. We have everything to fulfill your floral needs including a huge selection of fresh cut flowers, arrangements, green plants, as well as, other floral and gift items. For flowers in town, across town, across the country or across the globe, Woodring's Floral Gardens is the florist for you! Welcome to our new site! If you are experiencing any trouble, please call us at 814-355-4771. Stunning in sapphire, this glorious glass lantern is the perfect presentation for a beautiful bouquet of yellow roses and blue iris. Later, add a candle for a gorgeous glow! A dreamy surprise any day of the week! As radiant as a sunbeam in spring, this magnificent mix of yellow roses and white lilies looks perfect in this pretty ceramic vase with fresh aqua glaze and distressed raised details. Baffled about what to send? Or perhaps you want to surprise them with a one-of-a-kind, artisanal arrangement? With our Deal of the Day bouquets, you pick your price and our expert florists exercise their creativity to design a beautiful bouquet using the freshest seasonal flowers available. They'll bubble over with happiness when this pink and purple surprise arrives! Presented in a charming bubble-textured pink glass vase, this beautiful bouquet of pink roses and pretty purple blooms is a delight on any occasion. 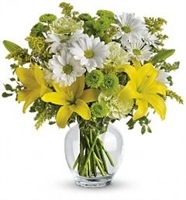 Let the sunshine in with this bevy of bright blooms – yellow lilies, green carnations and other sunny favorites beautifully arranged in a classic ginger jar. Perfect for birthday, get well, thank you – or just to say “Hi!” They’ll love it. A sweet treat any day of the week! Warm, rich colors of pink and orange are contrasted with fresh green – a welcome combination for any occasion. Send it to sweeten a best friend's birthday, say "hi" to mom, or delight your better half.